Manufactured in Europe, this glass cabinet is an ideal solution for anybody who desires a unique, minimalist look combined with spacious, strong storage capacity. It comes in an attractive matt white finish mixed with natural oak veneer, simultaneously creating a sleek, modern yet retro look in your home. Model in package, designed for self assembly. Is a unique combination of pure white finish with natural shades of wood which is ideally suited for modern and functional storage requirements. - This glass cabinet is made of strong, robust MDF and painted white mat with attractive elements of natural wood and oak veneer. It has six doors (including two glass fronts), two glass shelves, and two shelves making it ideal for modern storage requirements. - Inspired by the 60's, this modern CEERVO collection is ideally suited to a retro style. It’s unusual shape and style, together with its modernist lines and minimal design are now amongst the most fashionable trends in the furniture sector. - Flat-Packed European manufactured furniture. Ready-to-assemble. Flat-Packed, ready-to-assemble European furniture. Easy to assemble with pins and eccentric type connections (cam lock nuts and cam screws). Brand New. Easy to follow clear visual assembly instructions. Please check size requirements to ensure the selected furniture meets requirements. 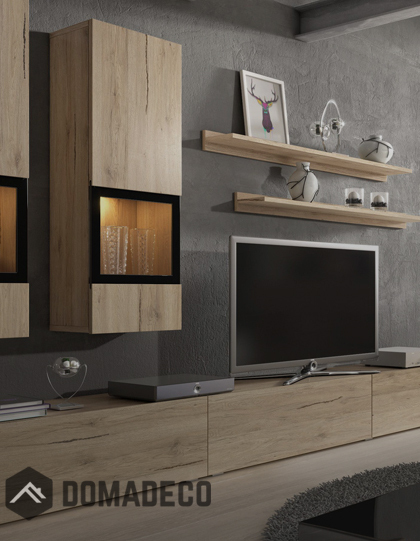 Keywords: glass cabinet – Italian – Oak Veneer – furniture – white matte – ideal – modern – functional – living room – clean-lined – retro – cable management – strong – robust – minimalist – lacquered – spacious – attractive – European – retro – sixties – sleek – storage - flat packed – new – appliances – European – self assembly – unusual – natural wood – doors – compartments – IR friendly – practical – living room – design – minimal.